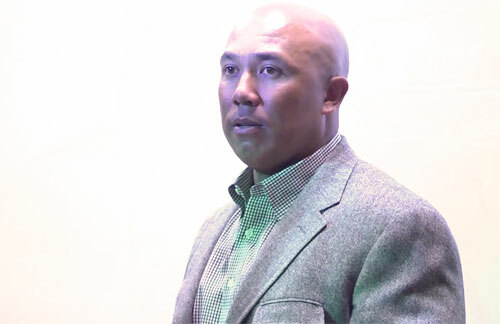 FT. COLLINS, CO. — Former Steelers wide receiver, Hines Ward, was the keynote speaker on Monday, April 6, for CSU’s Asian/Pacific Islander Awareness Month. The two-time super bowl champion, touched upon racial inclusion and the difficulties he had to overcome growing up half black, half Korean, but focused mainly on football. Head coach Mike Bobo brought his old teammate in to speak to a room full of 200 Colorado State Rams. 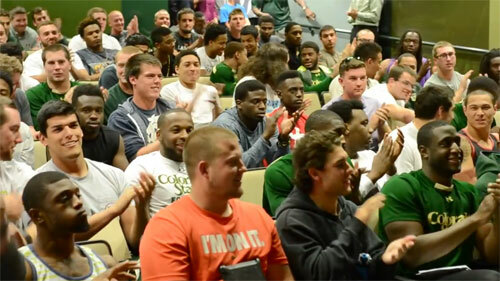 Photo shows Colorado State Rams welcoming guest speaker, Hines Ward, on April 6, 2015. Hines Ward is a retired wide receiver who played fourteen seasons for the Pittsburgh Steelers. He played college football at the University of Georgia. The Pittsburgh Steelers chose him in the third round of the 1998 NFL Draft, and became the team’s all-time leader in receptions, receiving yardage and touchdown receptions. Ward was voted MVP of Super Bowl XL, and upon retirement was one of only eight NFL players to have 1,000 or more career receptions. Besides his career in the NFL, Ward also appeared on the reality TV series Dancing With The Stars where he won the Mirror Ball Trophy. He is currently a studio analyst for NBC’s Football Night in America.